It’s fascinating to think about life in other ages, though significantly harder (for me, at least) to separate those epochs in my mind and understand the differences, and which developments took place when. Málaga is a city that offers answers to many of those questions. A visit to the caves and museum La Araña, a little to the east of Málaga, had sparked my interest in a way that history classes at school never had. Perhaps it was because the Head Archaeologist himself showed us round, or perhaps it was his light-hearted and very human style of presentation, and certainly it was when he led us deep into the caves and then turned off the lights, but this visit kindled a desire to discover more of Málaga’s fascinating and layers of history. Julian, the bearded archaeologist, also changed forever my use of the word “Neanderthal”. Sloppily, like many people, I use the word as a short-hand for any ignorant, knuckle-dragging idiot. This is desperately unfair (on the Neanderthals!). As we sat quietly in the network of caves with just a flickering candle for light, Julian described how this inner cave was used by the youngsters, while the parents were in the cave nearer the entrance. Not only were the children unable to pass without being noticed, but the acoustics meant that the parents could hear clearly whether the children were chatting or sleeping, and the children could just hear the distant comforting sound of their parents further below. Julian showed us the different forms of knives, and casually mentioned one which was used to mince and mash the food so that the toothless elders of the community could eat. In that moment, he painted a picture that brought to life these hard-working Neanderthal cave-dwellers as individuals and families, cutting up food for granny, listening for the children’s voices, caring and loving, just like us. I told Julian how the word is used in modern Britain and he laughed. It’s not used that way in Spain, he said, but mostly because pre-history is not well-taught and this era is glossed over in a few moments of the teachers’ time. I’ve already written about the superb Museo de Málaga (Blog post 169). 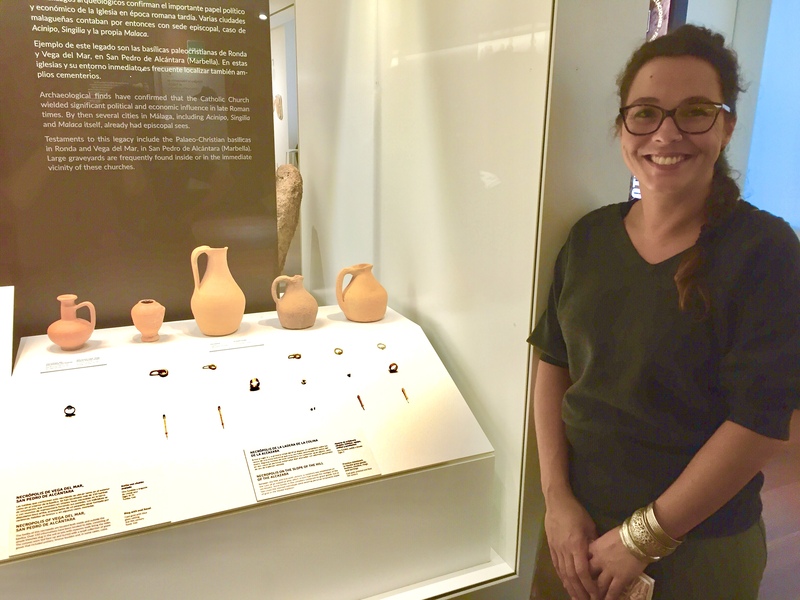 Earlier this month I had the chance to go again, this time with another archaeologist, a young woman who had actually found many of the items in display. Golly, it adds an element of reality to the tour! 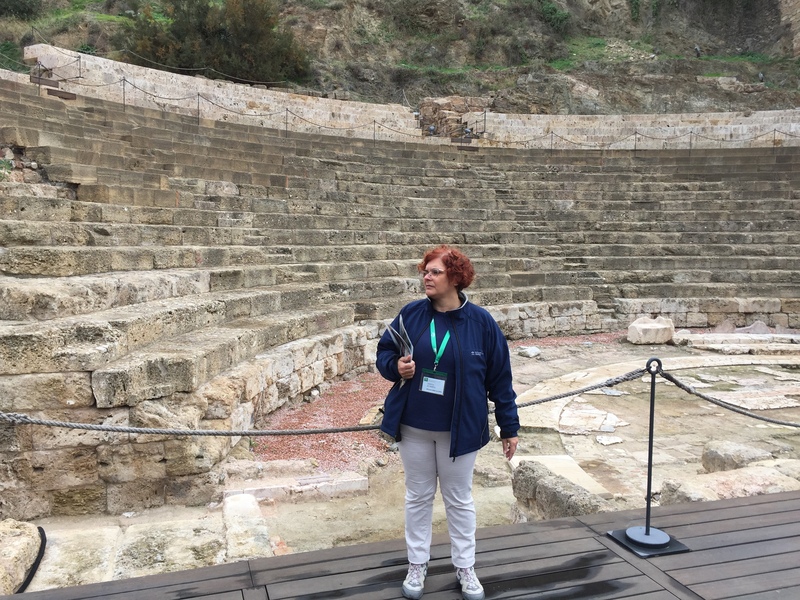 First we visited the roman theatre (el teatro romano). 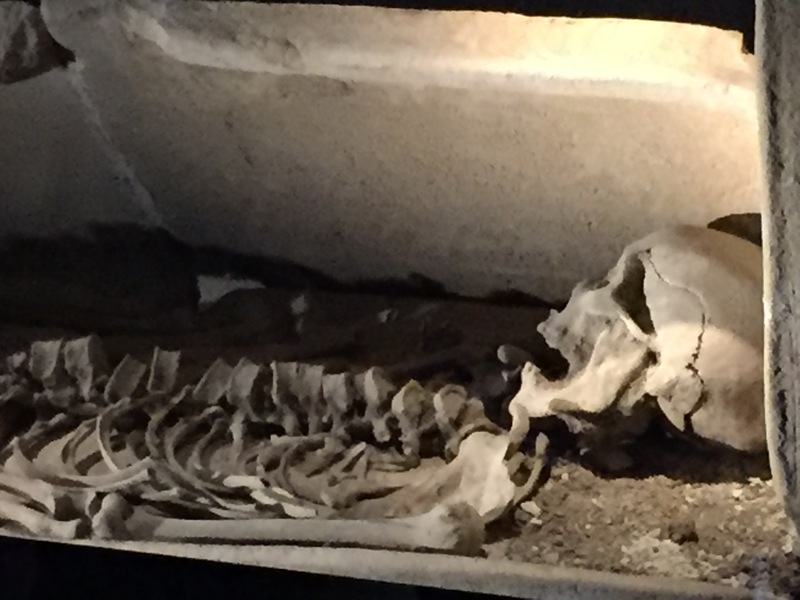 In the Visitors’ Centre there is a fairly splendid skeleton, which had been found beneath the pedestrianised road which now runs beside the roman theatre. “Yes I found her” said Olga, casually, adding that the woman’s rings and bracelets are now in the main museum. After the tour of the roman theatre with a guide who has to be one of the funniest I’ve ever heard, Olga led us through the historic centre of Málaga, following the line of the old city walls, and showed us into a number of public and private buildings in which the ancient walls can be seen well-preserved in basements. At some sections, she waved her hand, blithely announcing “I found this section, too”. 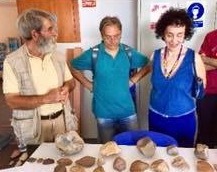 In many countries, a young archaeologist in the 21st century can work their whole lives and just find fragments of Roman porcelain or Neolithic arrowheads. But for Olga and for us, Málaga with its multi-layered past buried not too deeply is the gift that keeps on giving. 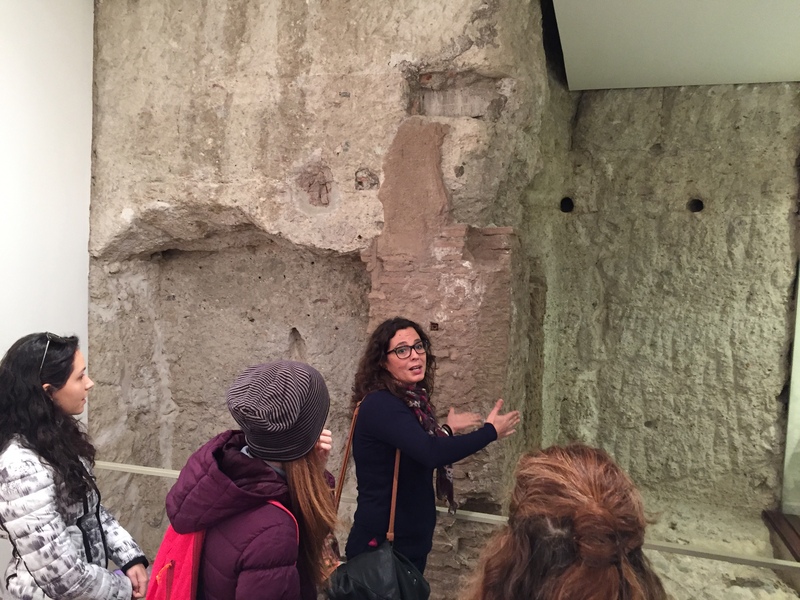 She showed us the stone stores she had uncovered where garum paste was made with fish blood and innards (commendably leaving nothing to waste, but … bleargh!). She described finding a skeleton – a person – and how the position in which they lay, and the adornments they wore told her reams about their life and their status. The Roman era was perhaps one of the most class-defined of all, and your status was constantly reinforced, whether by where you sat in the theatre, by how far down the staircase the home-owner came to greet you, or by how far into the home (through how many patios) you were permitted. Later, in the museum itself, I asked Olga if I could take a photo of her beside some treasure she had found. “Certainly”, she said. “The jewellery? The skeleton? The pottery? The coins? The garum stores? The statue? …”. She could go on. “The jewellery”, I said, cutting her long list short. And now it is the Christmas season, and Málaga does it magnificently. 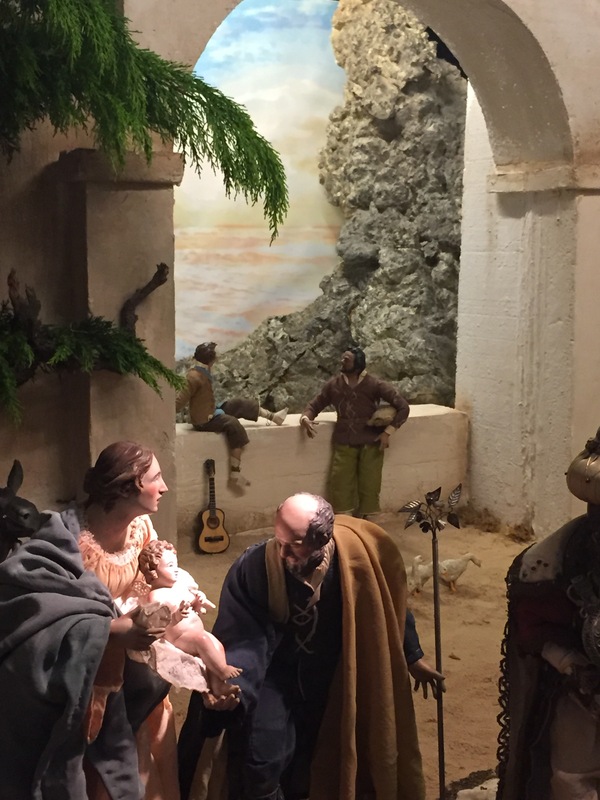 The lights are on in Calle Larios, and the nativity scenes (los belenes) are in place. Another glance back to life 2,000 years ago, a belén here in Spain is so much more than just the little stable scene that is traditionally seen in Britain. 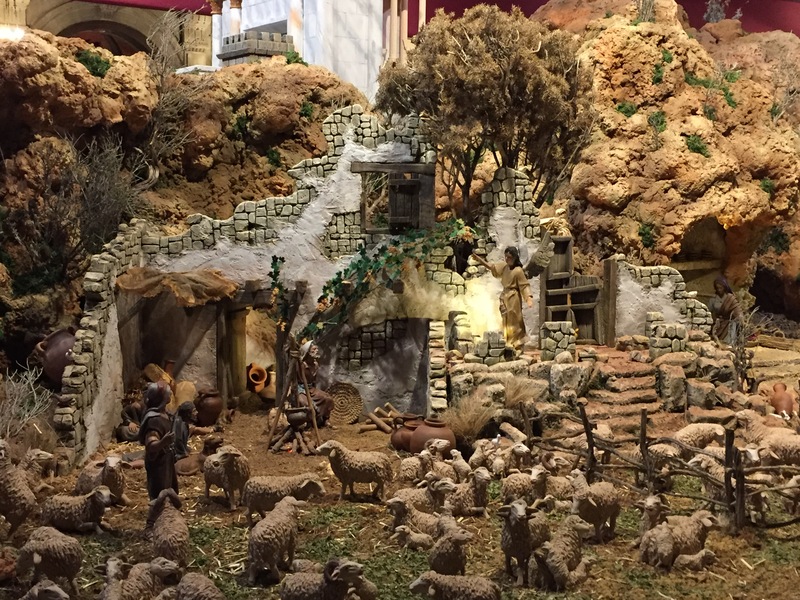 “Belén” is the Spanish for Bethlehem, and so the entire village is laid out, often covering 30 square metres or more. Figures and sections depict Egypt with pyramids and camels, the imperial Roman empire, and the Palestinian village of Bethlehem, surrounded by village life continuing as normal – market stalls, fishermen returning with their catch, a bakery, a wine seller. In the centre of all this normality is the stable scene, beautifully lit. Geography gets fudged somewhat – the cathedral belén includes Málaga’s roman theatre, and the lovely Italianate one in Museo Carmen Thyssen has a backdrop behind the stable, of Málaga port and beach, with a flamenco guitarist sitting on the wall! Families file past, pointing out the different stories to their children, and unknowingly teaching them, too, about life in Roman times. We learn our history through many forms. History lessons probably sink in for some people but certainly don’t for others. Christmas subliminally teaches us quite a lot about the Roman empire and how people lived; we have fairly clear images of people’s clothing and lifestyles, whether rich togaed Romans or poor Bethlehem shepherds. A single line from a bearded archaeologist can change your perception of an ancient people. And sharing a beer and some boquerones with a young woman who regularly digs up dead Romans, Visigoths and Neanderthals can awaken a desire to explore more of what lies six feet below my feet as I explore Málaga’s 21stC depictions of the Bethlehem of 2,000 years ago. 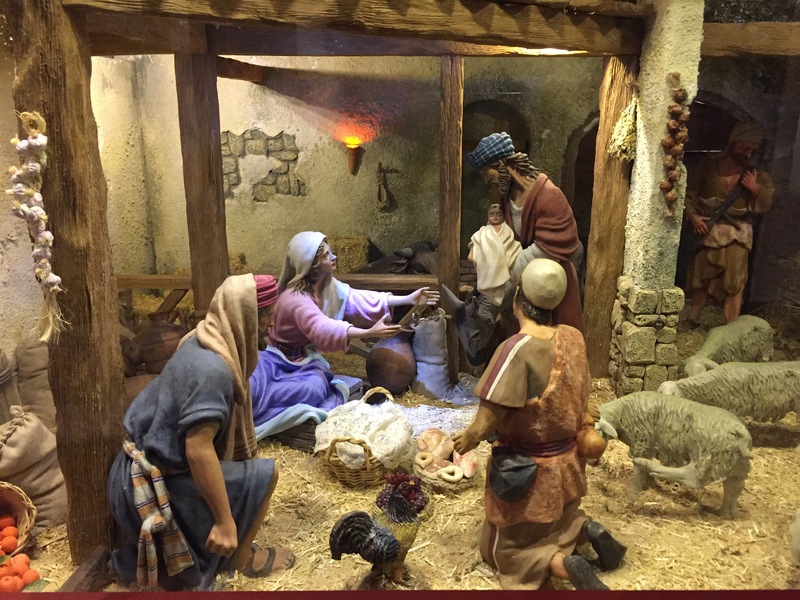 This entry was posted in Spain and tagged archaeology, belenes, Christmas, Málaga, Museo de Málaga by tamaraessex. Bookmark the permalink. Thank you Tamara, once again, for bringing Malaga into my home. Your descriptive passages let me feel your experiences. Very interesting article: thank you. Just like being there. Thankyou. When is your next blog entry, can’t wait? The last post here was a while ago. Does anyone know why? Probably because it was a blog posted o er a year ago people havent been following it as closely. Hi Brian! Thanks for the comment. I began the blog to help other “newbies” settle into their new life in Spain. Now that my life here is rather “normal” and I am not having many new or complicated experiences, I don’t feel I have much to say! Understand completely that things become normal however than is also nice to hear about. As someone who has lived in Spain, and had to return to the UK for my spouse’s health, I would value a commentary on daily life in Spain. It could take me back to the endless summer days we used to have. I am just very pleased to hear you are ok. Hope your recovery is progressing well.